no reservations - go get it! 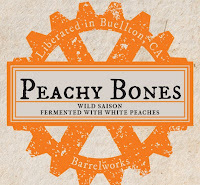 Another offering from our “Bones” series, featuring the fermentation of fresh fruit. In this instance California white peaches from Sanger, CA are fermented with a brett’d saison that has been maturing four months in French oak barrels. The synergy between fresh peach, wild microflora and oak components create a bright white peach flavor mingling with spicy yeast and oak aromas. Soft acidity and a firm carbonation lend “pop” to the overall sensory experience. It took four separate fermentations to create this concoction. Santé! In 2018 we challenged ourselves to using an array of fruit new to our palettes and practices. When offered a high quality freshly picked Black Currant sample, we couldn’t resist. We present to you a metamorphosis for your senses. Using 12 to 36month aged Agrestic Ale as a base, to which we add 1.5lbs/gal Black Currants, the beer undergoes the final maturation in our French Oak “Fruiders” for an additional four months. A convergence of supple tannin and deep purple pigments, gooseberry jam, a mouth-watering acidity and earthy leather elicit notes of a beer having vinous roots. A new variant to one of the Barrelworks pioneers is born. Santé!